Nail polish (also known as nail varnish) is a lacquer that can be applied to the human fingernails or toenails to decorate and protect the nail plates. The formulation has been revised repeatedly to enhance its decorative effects and to suppress cracking or flaking. Nail polish consists of a solution of an organic polymer and several other components, depending on the brand. In Egypt, the lower classes wore pale colors, whereas high society painted their nails a reddish brown, with henna. It was also known that mummified pharaohs would have their nails painted by henna. By the turn of the ninth century, nails were tinted with scented red oils, and polished or buffed. In the nineteenth and early twentieth centuries, people preferred a polished rather than a painted look by mixing tinted powders and creams into their nails, then buffing them until shiny. One type of polishing product sold around this time was Graf's Hyglo nail polish paste. Nitrocellulose is a film-forming polymer that is the main ingredient in most nail polishes. Plasticizers to yield non-brittle films. Dibutylphthalate and camphor are typical plasticizers. Dyes and pigments. Representative compounds include chromium oxide greens, chromium hydroxide, ferric ferrocyanide, stannic oxide, titanium dioxide, iron oxide, carmine, ultramarine, and manganese violet. Opalescent pigments. The glittery/shimmer look in the color can be conferred by mica, bismuth oxychloride, natural pearls, and aluminum powder. Adhesive polymers ensure that the nitrocellulose adheres to the nail's surface. One modifier used is tosylamide-formaldehyde resin. Thickening agents are added to maintain the sparkling particles in suspension while in the bottle. A typical thickener is stearalkonium hectorite. Thickening agents exhibit thixotropy, their solutions are viscous when still but free flowing when agitated. This duality is convenient for easily applying the freshly shaken mixture to give a film that quickly rigidifies. Ultraviolet stabilizers resist color changes when the dry film is exposed to sunlight. A typical stabilizer is benzophenone-1. 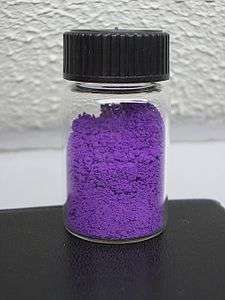 Manganese violet is a typical pigment in nail polish. Gel polish is a long-lasting variety of nail polish made up of a type of methacrylate polymer. It is painted on the nail similar to traditional nail polish, but does not dry. Instead it is cured under an ultraviolet lamp or ultraviolet LED. While regular nail polish formulas typically last two to seven days before chipping, gel polish can last upwards of two weeks with proper application and home care. Gel polish can be more difficult to remove than regular nail polish. It is usually gently pushed off (often with a wooden stick) after soaking the nails in acetone (The solvent used in most nail polish removers) for eight to fifteen minutes. Traditionally, nail polish started in clear, red, pink, purple, and black. Nail polish can be found in diverse variety of colors and shades. Beyond solid colors, nail polish has also developed an array of other designs, such as crackled, glitter, flake, speckled, iridescent, and holographic. Rhinestones or other decorative art are also often applied to nail polish. On-line tutorials are available. Some polish is advertised to induce nail growth, make nails stronger, prevent nails from breaking, cracking and splitting, and to even stop nail biting. French manicures are designed to resemble natural nails, and are characterized by natural pink base nails with white tips. French manicures were one of the first popular and well known color schemes. French manicures may have originated in the eighteenth-century in Paris and were most popular in the 1920s and 1930s. One updated trend involves painting different colors as the tips of the nails instead of the basic white. French tip nails can be made with stickers, stencils or with a basic toothpick. Social media has given rise to the nail art culture that allows users to share their pictures about their nail art. "WWD reports nail polish sales hit a record $768 million in the U.S. in 2012, a 32% gain over 2011, despite a cluttered market that seemingly sees a new launch each week." Several new polishes and related products came on to the market in the second decade of the twenty-first century as part of the explosion of nail art, such as nail stickers (either made of nail polish or plastic), stencils, magnetic nail polish, nail pens, glitter and sequin topcoats, nail caviar (micro beads) nail polish marketed for men, scented nail polish, and color changing nail polish (some which change hue when exposed to sunshine, and ranges which change hue in response to heat). Pinterest, Instagram, and YouTube have been popular social media sites on which many people around the world are posting their unique nail art. This is good for viewers because it can give them an idea of what kind of nail art they could try for themselves. Nail polish in the Western world has traditionally been worn by women, going in and out of acceptability depending upon moral customs of the day. In Victorian era culture it was generally considered improper for women to adorn themselves with either makeup or nail coloring, with natural appearances being considered more chaste and pure. In the 1920s, however, women left corsets and long gowns behind, changed to simple loose-fitting dresses, and began to wear color in new makeups and nail products, partly in rebellion to such prim customs of their recent past. Since the 1920s, nail colors progressed from French manicures and standard reds to various palettes of color choices, usually coordinated with the fashion industry's clothing colors for the season. Men have begun to wear clear polish on their nails to protect them from breakage, and as recorded from 2013, a few men have also started to wear colored nail polish on their toenails, and some even on their hands, possibly arising from its use by rock music musicians or in Goth subculture. While pastel colors such as pink are not typically worn by men, colors such as black, gun metal, silver, olive green, or brown are more often seen. This is especially true in warm climate areas where open-toed shoes are worn and can mask damaged or disfigured nails. Nail polish can be removed with nail pads or nail polish remover. The remover is an organic solvent, but may also include oils, scents, and coloring. Nail polish remover packages may include individual felt pads soaked in remover. Some removers are a bottle of liquid remover that can be used with a cotton ball or cotton pad. Others can be containers filled with foam that can be used by inserting a finger into the container and twisting until the polish comes off. Choosing a type of remover is determined by the user's preference and often the price or quality of the remover. The most common remover is acetone. This can be harsh on skin and nails, and can also remove artificial nails made of acrylic or cured gel. A less harsh nail polish remover is ethyl acetate, which often also contains isopropyl alcohol. Ethyl acetate is usually the original solvent for nail polish itself. Acetonitrile has been used as a nail polish remover, but it is more toxic and potentially carcinogenic. It has been banned in the European Economic Area for use in cosmetics since 17 March 2000. The health risks associated with nail polish are disputed. According to the U.S. Department of Health and Human Services), "The amount of chemicals used in animal studies is probably a couple of hundred times higher than what you would be exposed to from using nail polish every week or so. So the chances of any individual phthalate producing such harm [in humans] is very slim." A more serious health risk is faced by professional nail technicians, who perform manicures over a workstation known as a "nail table," on which the client's hands rest – directly below the technician's breathing zone. In 2009, Dr. Susan Reutman, an epidemiologist with the U.S. National Institute for Occupational Safety and Health's Division of Applied Research and Technology, announced a federal effort to evaluate the effectiveness of downdraft vented nail tables (VNTs) in removing potential nail polish chemical and dust exposures from the technician's work area. These ventilation systems have potential to reduce worker exposure to chemicals by at least 50%. Many nail technicians will often wear masks to cover their mouth and nose from inhaling any of the harsh dust or chemicals from the nail products. According to Reutman, a growing body of scientific literature suggests that some inhaled and absorbed organic solvents found in nail salons such as glycol ethers and carbon dilsufide may be human reproductive toxicants. These are responsible for effects including birth defects, low birth weight, miscarriage, and preterm birth. Nail polish formulations may include ingredients that are toxic or effect other health problems. One controversial family of ingredient are phthalates, which are implicated as endocrine disruptors and linked to problems in the endocrine system and increased risk of diabetes. Manufacturers have been pressured by consumer groups to reduce or to eliminate potentially-toxic ingredients, and in September 2006, several companies agreed to phase out dibutyl phthalates. 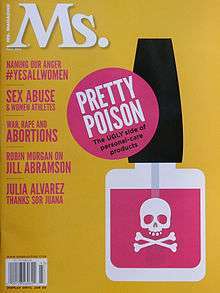 There are no universal consumer safety standards for nail polish, however, and while formaldehyde has been eliminated from some nail polish brands, others still use it. The U.S. city of San Francisco enacted a city ordinance, publicly identifying establishments that use nail polishes free of the "toxic trio" of toluene, dibutyl phthalate and formaldehyde. Nail polish is considered a hazardous waste by some regulatory bodies such as the Los Angeles Department of Public Works. Many countries have strict restrictions on sending nail polish by mail. Although nail polish is considered a potential household hazardous waste product, in 2001, 350,000 bottles were disposed in landfills in Tucson, Arizona. The majority of these bottles are cracked, and the intact bottles still contain a decent amount of polish residue. Tucson can serve as a model city, as it is of average size. In 2012, $768 million worth of nail polish was sold in the United States with the numbers increasing since then. The "toxic trio" is currently being phased out, but there are still components of nail polish that could cause environmental concern. Two particular pigments common in nail polish have shown evidence of going through chemical degradation, and with the amount of nail polish being improperly disposed, could have similar effects in landfills. These two pigments are chromium oxide greens/chromium hydroxide and ferric ferrocyanide, or Prussian blue. Although this Keq appears low, CrO42- is a highly oxidative carcinogen which can cause toxicity to plants from .5 ppm in water and 5 ppm in soil. This reaction is plasuible, as Manganese (IV) oxide is naturally-occurring as well as being present in batteries, with around 500,000 tons being used for dry-cell batteries per year. Despite both dry-cell batteries and nail polish being considered potential household hazardous waste products by the EPA, if nail polish is improperly disposed, it is a rational assumption that some batteries would be improperly disposed as well. Further study needs to be done about whether nail polish disposal on its own can cause harmful environmental effects, but .5 ppm is equivalent to .029 grains/gallon, so even if this reaction is extremely rare, any reaction has the potential to cause toxicity to plants. where C is concentration, (CN, t) is cyanide concentration at a specified unit of time, (CN, 0) is initial cyanide concentration, and t is time. These cause problems, as free cyanide blocks cytochrome c oxidase, a vital component of aerobic metabolism, which can cause mortality at a threshold concentration, which is different for most cyanide concentrations. Where Cgw is the concentration of compound in water (mgcompound/Iwater), IRgw is the drinking water ingestion rate (Iwater/day), and BW is the body weight in kg. This dissociation has been shown to occur in the soils of manufactured gas plant sites. This indicates a possibility of these reactions occurring in soil contaminated by nail polish, although no exact studies have been conducted on whether or not these reactions do occur. 1 2 3 4 5 Toedt, John; Koza, Darrell; Cleef-Toedt, Kathleen van (2005). Chemical Composition Of Everyday Products. Greenwood Publishing Group. p. 49. ISBN 978-0-313-32579-3. 1 2 Sherrow, Victoria (2001). For appearance' sake: The historical encyclopedia of good looks, beauty, and grooming. Phoenix: Oryx Press. p. 119. ISBN 978-1-57356-204-1. ↑ Draelos, Zoe Diana (2011). Cosmetic Dermatology: Products and Procedures. John Wiley & Sons. p. 46. ISBN 978-1-4443-5951-0. ↑ Alpert, Arlene; Altenburg, Margrit & Bailey, Diane (2002). Milady's Standard Cosmetology. Cengage Learning. p. 8. ISBN 978-1-56253-879-8. ↑ Toedt, John; Koza, Darrell; Cleef-Toedt, Kathleen van (2005). Chemical Composition Of Everyday Products. Greenwood Publishing Group. p. 50. ISBN 978-0-313-32579-3. ↑ Molina, Christina (31 March 2014). "How to Actually Remove Glitter Nail Polish for Good". Elle.com. Hearst Communications, Inc. Retrieved 2 April 2014. 1 2 Sun, Feifei (2013-01-28). "Nail Polish Sales Hit Record $768 Million in U.S.". Time. Retrieved 2013-12-06. ↑ "Manly Manicures End in Color". The New York Times. 2013-06-12. Retrieved 2015-07-14. ↑ Mismas, Michelle. "Can you describe the different types of nail polish finishes?". AllLacqueredUp.com. All Lacquered Up. Retrieved 3 April 2014. ↑ "What is a jelly polish?". nouveaucheap.blogspot.com. Retrieved 1 September 2014. ↑ "Safety Data Sheet: Acetone" (PDF). JM Loveridge. Retrieved 2013-12-06. ↑ "Safer alternatives. Nail polish remover". Poison Control Center. Children's Hospital of Philadelphia. Retrieved 3 June 2013. ↑ Twenty-Fifth Commission Directive 2000/11/EC of 10 March 2000 adapting to technical progress Annex II to Council Directive 76/768/EEC on the approximation of laws of the Member States relating to cosmetic products. OJEC L65 of 14 March 2000, pp. 22–25. ↑ Bender, Michele (2004). "Nail polish gets a healthy makeover". Health. 18 (10): 34. 1 2 Reutman, Susan (3 March 2009). "Nail Salon Table Evaluation". National Institute for Occupational Safety and Health (NIOSH) Science Blog. Centers for Disease Control and Prevention. Retrieved 3 April 2014. ↑ Marlow, David A.; Looney, Timothy; Reutman, Susan (September 2012). "An Evaluation of Local Exhaust Ventilation Systems for Controlling Hazardous Exposures in Nail Salons (EPHB Report No. 005-164)" (PDF). Department of Health and Human Services, Centers for Disease Control and Prevention, National Institute for Occupational Safety and Health. Retrieved 5 March 2013. ↑ "Dangers of Nail Polish – Toxic Chemicals in your nail polish". TorquayHeraldExpress.co.uk. Local World, Ltd. 1 April 2014. Retrieved 2 April 2014. With inviting names such as peaches and cream or Caramel Smoothie, you are led away from the potential dangers of these polishes, with some ingredients that are known cancer causing chemicals and those toxic to the nervous system. The top three chemicals of concern are toluene, dibutyl phthalate (dbp) and formaldehyde – the so called 'toxic trio'. ↑ Singer, Natasha (7 September 2006). 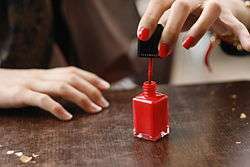 "Nail Polish Makers Yield on Disputed Chemical". The New York Times. ↑ Phthalate chemicals in nail polish, hair sprays tied to raised diabetes risk in women. CBS News (2012-07-16). Retrieved on 2015-11-22. ↑ Simon, Pitman (30 August 2006). "Nail Polish manufacturers remove potentially harmful chemicals". Cosmetic Design USA. William Reed Business Media. ↑ Brown, Patricia Leigh (10 November 2010). "At Some Nail Salons, Feeling Pretty and Green". The New York Times. ↑ "What is Household Hazardous Waste (HHW)?". County of Los Angeles Department of Public Works. Retrieved 7 August 2013. ↑ "Restricted goods – personal customers: Things we can carry in UK post but with restrictions". Royal Mail. Retrieved 2013-12-06. ↑ "Restricted and Hazardous Materials". US Postal Service. Retrieved 2013-12-06. 1 2 "Household Hazardous Waste". ↑ "Nail Care Products". fda.gov. Food and Drug Administration. 1 2 Fendorf, Scott. "Surface Reactions of Chromium in Soils and Water". Geoderma. ↑ Shanker, Arun K. "Chromium Toxicity in Plants". Environmental International. ↑ "Equilibirum Constants for Acids and Bases in Aqueous Solutions". ↑ Reidies, Arno H. (1999). Ulmann's Encyclopedia of Industrial Chemistry. ISBN 9783527306732. ↑ Sut, Magdalena; Repmann, Frank; Raab, Thomas (2015). "Retardation Of Iron-Cyanide Complexes In The Soil Of A Former Manufactured Gas Plant Site". Journal Of Environmental Science & Health, Part A: Toxic/Hazardous Substances & Environmental Engineering. 50.3: 282–291. ↑ Sut, Magdalena; Repmann, Frank; Raab, Thomas (2014). "Stability Of Prussian Blue In Soils Of A Former Manufactured Gas Plant Site". Soil & Sediment Contamination. 23.5: 504–522. 1 2 Dzombak, David A.; Ghosh, Rajat S.; Wong-Chong, George M. (2005). Cyanide in Water and Soil: Chemistry, Risk, and Management. CRC Press. pp. 315–325. ISBN 9781566706667. ↑ Yu, X. Z.; Peng, X. Y.; Wang, G. L. (2011). "Photo induced dissociation of ferri and ferro cyanide in hydroponic solutions". International Journal of Environmental Science and Technology. 8 (4): 853–862. Wikimedia Commons has media related to Nail polish.